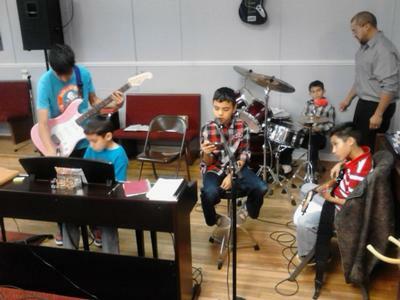 Kids practicing in church Josh is the one standing with the guitar, by the piano. My pastor and his wife lost their 15 yr old son Joshua Lorenzo Ramirez just 10 days ago. They also have 2 daughters ages 17 and 12 and another son age 9. It has been a shock to us all, it was one of those freak accidents you hear about on TV. He got hit on the side by a flying discus at a track meet while he was stretching. He didn't feel much pain at first so he just rode back with the school bus home, and within 7 days he passed away at the hospital after getting put in ICU. He made a great impact in my life, he was a great example to not only the kids but to us adults as well. He will be greatly missed. He was also very talented. He knew how to play the guitar and piano and was learning other instruments. He was also a runner, he loved to run. Sometimes in the morning he'd go by my house and my 11 yr old son would go run with him. The last Sunday he was in church he sang "The Old Gospel Ship". He always had a smile on his face, and I remember him and my son Luke would always be joking around. We went to some church revivals in Austin TX at the beginning of this month and he rode with my husband and I, he also went with my family to a play my niece was in. The kids in church were also practicing and learning music and he was a part of that. These are all wonderful memories that I will always have in my heart. I loved him and so did my husband and my kids. I wish there was something I could do or say to my pastor and his wife and his siblings, but the most I could do is be there and just let them know they have all our love and support. They also have a whole town of support. The day after he passed away all of his track team and school mates let balloons go in his memory, and wore red to school because that was his favorite color. It's amazing how so many people came together. I thank God for getting to know him and putting him in my life. He was a wonderful wonderful kid. RIP Josh. Love you. I just want to say that the Ramirez family is in our constant prayers and their faithfulness to God in this extremely difficult time is of much inspiration to me. I love you guys and I believe that God will carry y'all until this is bearable. He was a special kid,and he will forever be missed. I will miss him playing at church and shaking his head at me.